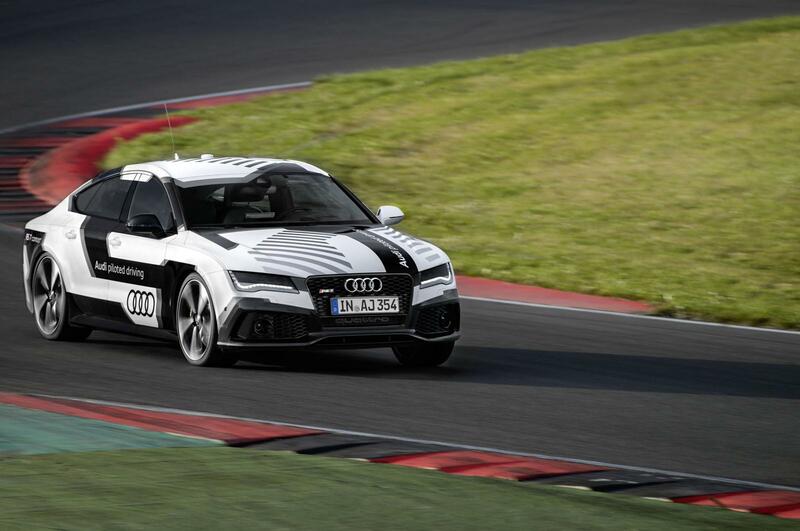 H Audi έδωσε τις λεπτομέρειες του RS7 piloted driving concept το οποίο θα το παρουσιάσει για πρώτη φορά στο κοινό κατά τη διάρκεια του τελευταίου αγώνα του DTM, στις 19 Οκτωβρίου στη πίστα του Hockenheim. Εξωτερικά μοιάζει με ένα κανονικό RS7, αλλά από κάτω του κρύβεται μπόλικη τεχνολογία που επιτρέπει το αυτοκίνητο να οδηγείται μόνο του. Το πρωτότυπο διαθέτει ένα προηγμένο GPS με ακρίβεια εκατοστού, το οποίο αναλαμβάνει να προσδιορίσει τη θέση του αυτοκινήτου στη πίστα, ενώ εξοπλίζεται και με μια 3D κάμερα, η οποία στέλνει τις εικόνες σε έναν υπολογιστή, που τις συγκρίνει με κάποια γραφικά που είναι αποθηκευμένα στη μνήμη του. Η Audi υποστηρίζει πως το σύστημα ψάχνει για εκατοντάδες γνωστά χαρακτηριστικά, όπως κτίρια και μοτίβα πίσω από τη διαδρομή της πίστας, και τα χρησιμοποιεί για να προσδιορίσει καλύτερα τη θέση του αυτοκινήτου. Οι παραπάνω τεχνολογίες επιτρέπουν το RS7 να μπορεί να κινηθεί με απόλυτο ρυθμό στην αγωνιστική γραμμή της πίστας του Hockenheim, πιάνοντας ταχύτητες έως και 240 χλμ/ώρα, σημειώνοντας χρόνο 2 λεπτών και 10 δευτερολέπτων σε έναν πλήρη γύρο στη γερμανική πίστα, αγγίζοντας τιμές 1,1 G πλευρικής επιτάχυνσης. 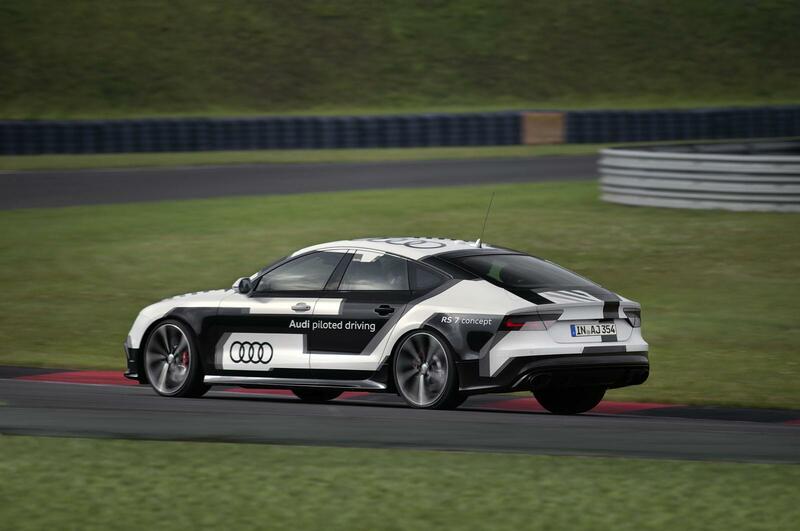 The Audi RS 7 piloted driving concept car on the race track The Audi RS 7 piloted driving concept car is a technology platform with which Audi is exploring the possibilities of piloted driving at its most dynamic. On Friday, October 17 and Sunday, October 19 – prior to the start of the last DTM race – the concept car will complete one lap on the Hockenheim ring without a driver. The large, five-door coupe is largely identical to the production model, but its electromechanical power steering, the brakes, the throttle valve and the eight-speed tiptronic that distributes the power to the mechanical quattro drive system are controlled automatically. 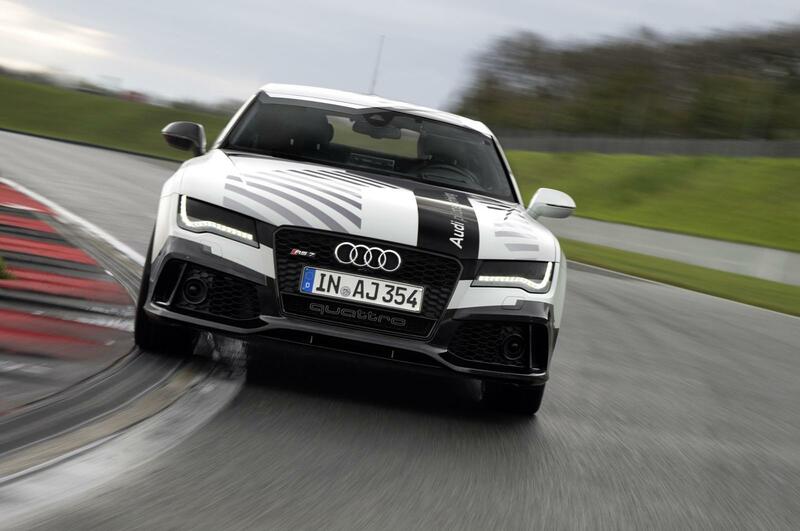 Control of the vehicle at the handling limits is another outstanding feature of the Audi RS 7 piloted driving concept car. Comprehensive on-board networking coupled with the highly precise control of all actors relevant to driving enable the technology platform to drive at the physical limits. 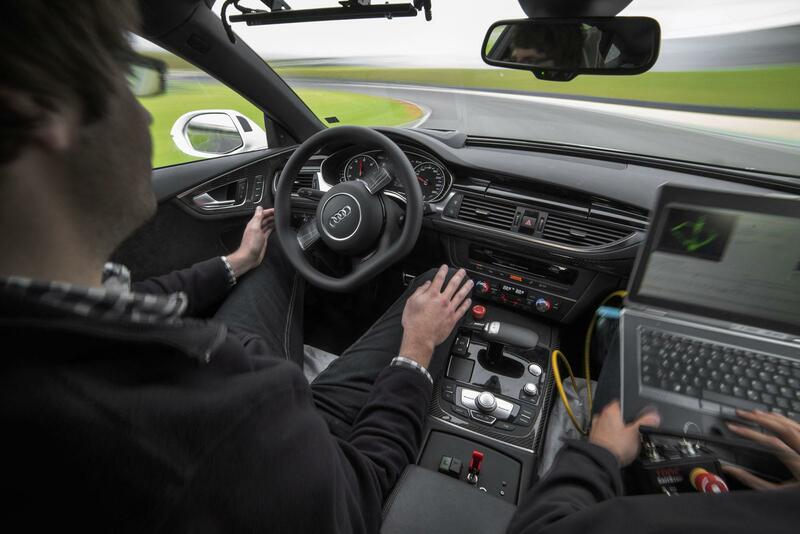 The Audi engineers intensively investigated piloted driving at the handling limits, putting the technology platform through several thousand test kilometers on a variety of routes. 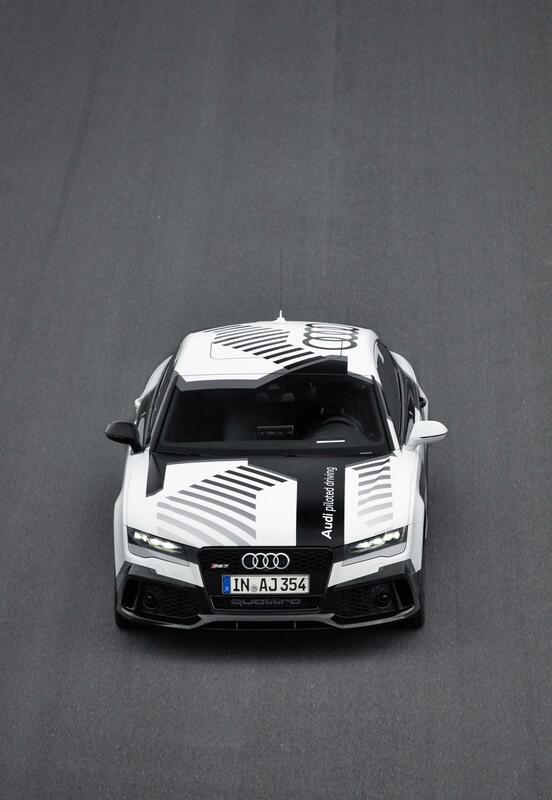 To demonstrate its capabilities, the Audi RS 7 piloted driving concept car will drive a clean racing line at the Hockenheimring – with full throttle on the straights, full braking before the corners, precise turn-in and perfectly metered acceleration when exiting the corners. 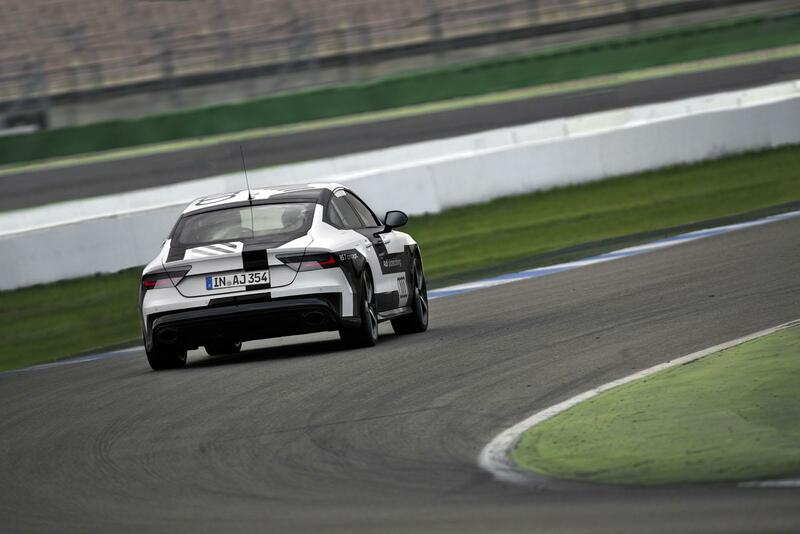 Forces of over 1.3 g occur during braking, and lateral acceleration in the corners can reach 1.1 g. Tests on the track in Hockenheim suggested an expected top speed of 240 km/h (149.1 mph) and a lap time of 2 minutes and 10 seconds. 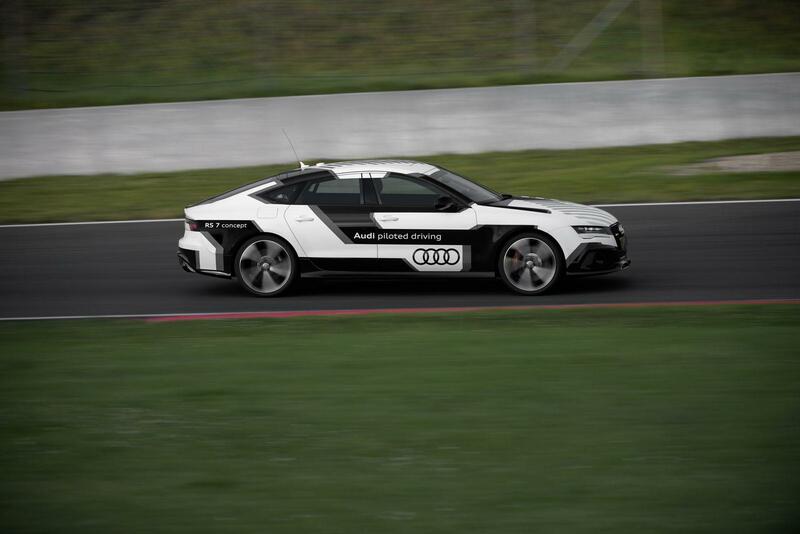 Piloted driving – highlights Audi has been working intensively on the subject of “piloted driving” for many years now. The development efforts have produced numerous spectacular driving feats – on public roads, on the race track and even on a salt bed. 2009: Bonneville Salt Flats In fall 2009, Audi took to the Bonneville Salt Flats in Utah, USA, with a driverless Audi TTS. Driving in precise curves, the white coupe carved the brand’s four rings into the salt bed. It also set a new speed record for piloted driving cars of 130 mph (approx. 210 km/h). 2010: Pikes Peak The next year, the piloted driving “Shelley” conquered the legendary Pikes Peak mountain race circuit in Colorado, USA. The technology platform covered the 20 kilometer (12.4 mi) course with a total of 156 corners in roughly 27 minutes, reaching a top speed of 45 mph (72 km/h). Navigation was already via differential GPS and accurate to just a few centimeters. 2012: Thunderhill Race Track In 2012, Audi garnered its initial experience with the Audi TTS on a race track – the Thunderhill Race Track north of Sacramento, California. The lap time on the roughly three-mile (nearly five kilometers) course was under 2 minutes and 30 seconds. 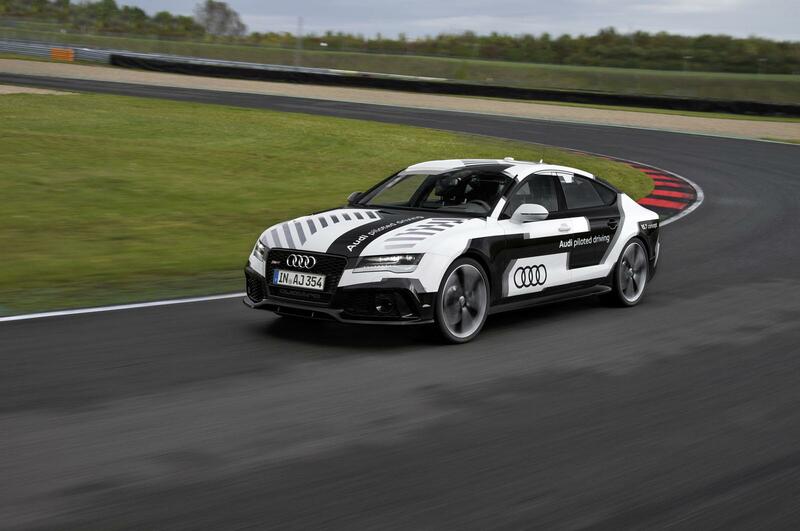 The tests were focused on how a piloted driving car behaves at high loads and under extreme conditions. 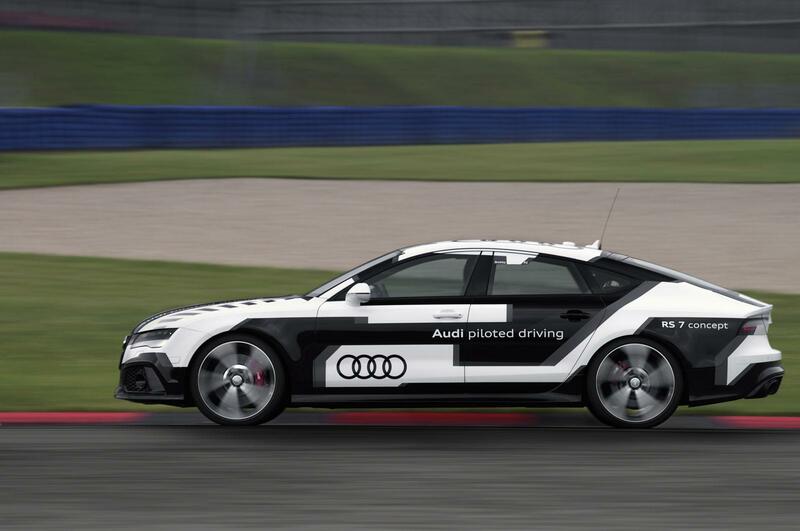 2013: Las Vegas The authorities in the US state of Nevada made the Audi the world’s first automobile maker to receive a permit to operate piloted driving cars in public traffic. In January 2013 and 2014, the brand presented new systems for piloted driving in traffic jams and for piloted parking at the International Consumer Electronics Show (CES) in Las Vegas. International trade journalists were on board both times. 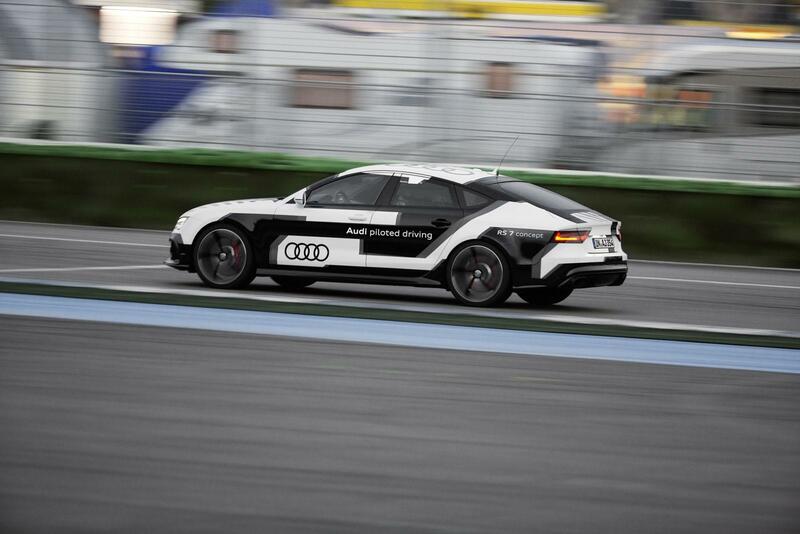 2014: Florida and California Audi is rapidly expanding its testing competence for piloted driving in the USA. This summer, the brand was once again the world’s first automobile maker to conduct a public test on the Lee Roy Selmon Expressway outside Tampa, Florida. The company this fall received the first test license under the new regulations in California, where test drives on the freeways are now generally permitted. 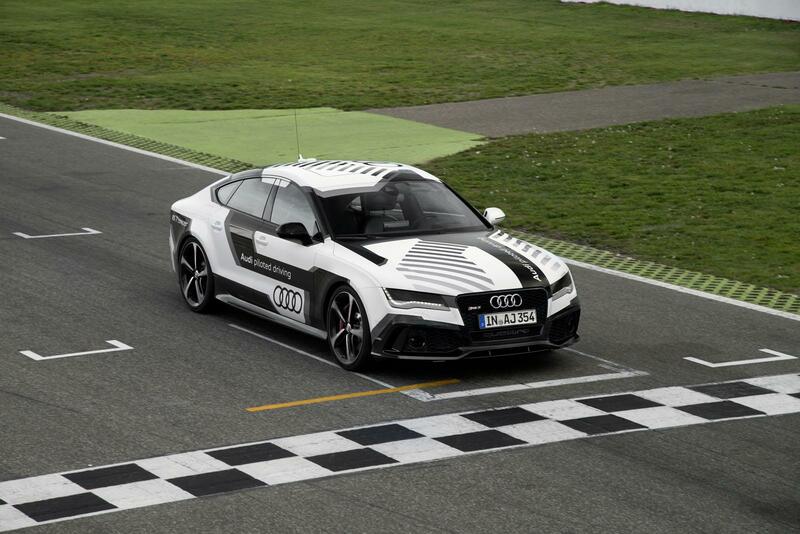 Piloted driving – future production technology The production technologies for piloted driving currently under development at Audi will make their way into cars before the end of this decade. The new systems will then take over the driving in certain situations, such as in traffic jams or when parking, making it even more convenient and safe. 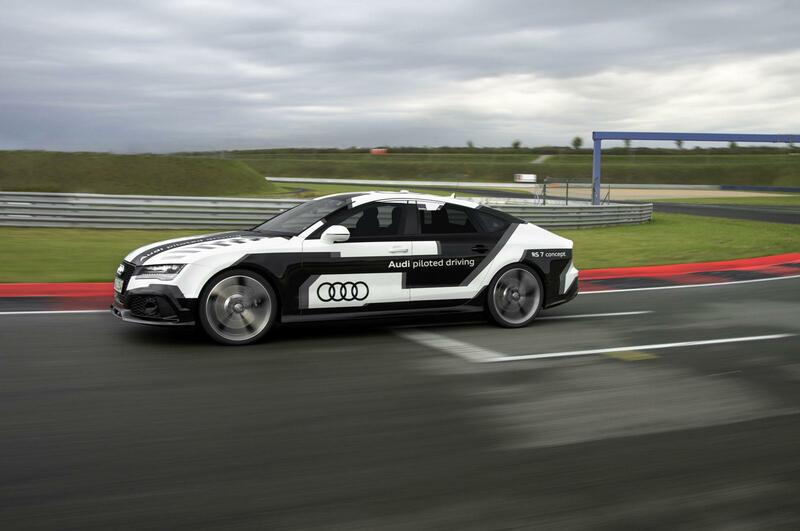 Piloted driving in traffic jams In the future, the “traffic jam pilot” will help Audi drivers by taking over the steering at speeds between 0 and 60 km/h (37.3 mph) in addition to accelerating and braking automatically. Piloted driving for parking maneuvers Parking maneuvers in tight situations are unpleasant – narrow parking spaces or garages make it difficult for the driver to get in and out of the car. With the “parking pilot” system from Audi, drivers can get out and control the car remotely using the remote key fob or a smartphone. This system uses the same sensor systems as the traffic jam pilot, but also uses its four 360° cameras to generate additional key information about its surroundings. The central driver assistance control unit (zFAS) Today’s driver assistance systems are usually managed by spatially separated control units. Audi, in contrast, is taking the novel approach of a central domain architecture. In the future, all available sensor information will flow into a central control unit (zFAS). This computes a complete model of the vehicle surroundings that is used by all of the assistance systems. The future systems for piloted driving will also draw on this redundantly computed information. Relaxed and under control– today’s driver assistance systems Audi already offers numerous driver assistance systems to make driving more relaxed and under control. No need is left uncovered, and the full capabilities of these systems are on display in the updated Audi A6* and Audi A7 Sportback* model series. Adaptive cruise control with stop & go function Of all the optional driver assistance systems offered by Audi, adaptive cruise control with stop & go function including Audi pre sense front is the most complex. It regulates the speed and the distance to the vehicle ahead by accelerating and braking in a range from 0 to 250 km/h (155.3 mph), and brakes automatically within certain limits. The driver can use Audi drive select to switch between four settings to specify just how comfortable or sporty the system should be. Audi side assist Audi side assist including Audi pre sense rear is activated at 30 km/h (18.6 mph). Two radar sensors at the rear of the car monitor what goes on behind it. If the system detects another vehicle moving into the critical zone from behind, a yellow LED display lights up in the housing of the exterior mirror. If the driver nevertheless activates the turn signal to change lanes, the indicator becomes brighter and begins to flash quickly – a signal that is hard to miss. Audi active lane assist Audi active lane assist employs a video camera to detect lane markings at speeds above 65 km/h (40.4 mph). If the car approaches a line without the turn signal being activated, the system helps the driver to steer back into the lane by intervening gently in the electromechanical power steering. Drivers use the MMI to specify how quickly this assistance system should intervene and whether the steering wheel should vibrate as well. If the driver selects early intervention, the system also helps to keep the car in the center of the lane. Camera-based speed limit display The camera-based speed limit display recognizes speed limit signs on the side of the road, their supplemental signs and the signs canceling speed limits. It presents these as graphics on the display of the driver information system or on the optional head-up display. Software compares images supplied by the video camera with map data from the optional MMI navigation plus. Night vision assistant Another high-end feature is the night vision assistant. Its thermal imaging camera uses far infrared technology to “see” up to 300 meters (984.3 ft) ahead. Data is converted into black-and-white images that are displayed on the large driver information system screen. People and animals appear conspicuously bright on the screen due to the heat they give off, whereas the surroundings appear dark. The software can detect people and large animals and highlights them in the display in yellow. Park assist with 360° display Audi offers various options that make parking easy. The park assist system with 360° display uses ultrasonic sensors to locate and measure parking spaces along the side of the road at low vehicle speeds. If a sufficiently large space is found, the system takes over parallel parking at the push of a button. The driver has to apply the gas and brake. Audi pre sense The Audi pre sense safety system is available in a number of different versions. In the standard version – Audi pre sense basic – the system intervenes immediately upon detecting an unstable driving situation via the ESC sensors. The front seat belts are electrically tensioned and the sunroof and the side windows are closed, leaving just a small gap. The vehicle’s hazard warning lights will warn the traffic behind.